Basic rules and tips on giving and receiving business card. More knowledge about etiquette will lead you to bigger success. Pay attention to the etiquette of exchanging business cards, which is essential for effective networking. As important as offering an impressive handshake and dressing with finesse, acknowledgement of the dons and don'ts of giving and receiving business cards will help your networking time and effort repay. Learn the following basic rules to follow for the profitable and productive exchange of business cards. 1. Always leave home or office with plenty of business cards so that you won't miss one single opportunity. 2. Keep your cards protected by a case from wear and tear. Never give tainted or crumpled ones because they will leave poor first impression. 3. Don't give business cards from back pockets. This is rude. 4. Always remember where to find your business cards. Looking for them by going through all pockets or every nook and cranny of a briefcase wastes others' time and loses credibility immediately. 5. Give the card in the direction that the person who is receiving it can read it without turning it around. 6. Remember to update your card in time especially the change of contact information. It is unprofessional to give cards on which you have crossed off some lines and written in the new information. 7. Avoid appearing aggressive with business cards. Wait to be asked for yours. If that isn't happening, ask the other person for one. Reciprocity usually follows. In China, if your boss is present, wait until your boss to give his and then give your own. 8. Hand them out with discretion. If you don't value your own card, receivers won't, either. 1. If you are sitting when receiving a card, stand up. 2. Use right hand to receive cards. In China, it is best to use both of your hands to receive business card. Always make a comment about a card when you receive it. Pay attention to the logo, the business name or some other piece of information. This shows that you value the card and the giver. 3. Avoid writing irrelevant information on somebody else's business card during the exchange. If you really need to write some reminder on the card, do it later out of sight. 4. Don't place others' cards at random on the table or other locations. This is disrespectful and you may forget to take it. 5. Never play with others' business cards. 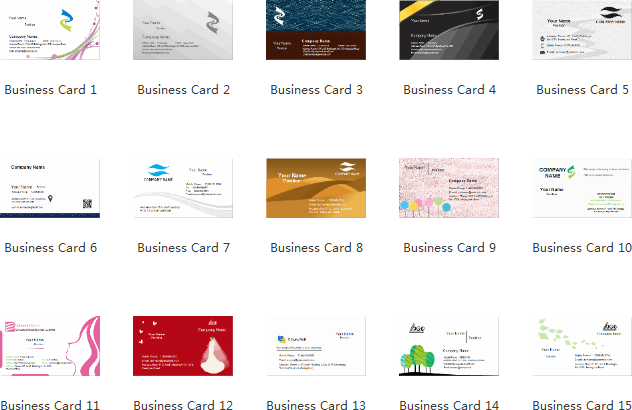 A bunch of beautiful business card templates are offered by Edraw. You can download them online or find them right in the software. Chek it out in the following pictures.